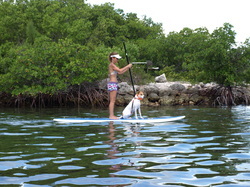 Rent a top of the line Paddle Board from Paddle Board The Keys. We deliver them right to your location. Explore the serene tranquil waters of the Florida Keys with Paddle Board The Keys on an eco-friendly stand up paddle board. See limitless species of marine life in their natural habitat without making the impact of a motor or gasoline. The workout you will get is just a fringe benefit. We deliver the rentals to you from Marathon to Big Coppitt. Our tours launch on the Cudjoe Bay or we will meet you at one of our many launch locations throughout the Keys. Call us for details and rates.